← Reuben goes Walkabout & The Consiglieri and I.
I know a lot of people who struggle with mental health issues, whether it is themself or because of one their friends or their family. I’m amazed at how wonderful and natural some people are with it and how uncomfortable and unkind others are. I always wanted to write about that to raise awareness and make people challenge themselves. I think we all (me very much included) have a lot to learn about full integration and tolerance. Where did you find these characters? Through real life. They all are blends of a large variety of sources: People I knew a long time ago, the person talking on their phone in the queue in front of me or a snippet from an overheard conversation without context- they all give me an idea. Then the story takes over and the characters change and develop and take on their own life. Do you write purely from imagination or do everyday scenes influence you? Very much both. Some of the storylines are based on real events, but they are also what I made of those events in my head. I find it quite boring to simply re-tell something that has already happened because it imposes a rigid structure and takes away the fun and ‘creative freedom’. In the writing process, the plot usually forces changes and new angles and by the time a book is published little is left of the original idea. Between the ages of 9 and 19 I performed a lot of amateur theatre, mainly fairy tales and small sketches. My first role was that of a wild boar and all I did was stand inside a papier mache replica of said boar and run across the stage. Later on I got to show my face and speak but somehow Steven Spielberg has not taken notice. I love the theatre and should go more often. ( So far, I haven’t found you the least Boar-ing ) (Sorry). Your name suggests a German Origin. How long have you lived in the UK and what made you choose to live here? Style of house? I came to the UK by a string of coincidences really. I participated in a student exchange programme in 1993 which resulted in me living with a Welsh partner and having a nice job in London. I had big ambitions for further travels and a career in films but subsequent job, house and partner changes brought me to the lovely rural cottage in Wiltshire where I currently live with another Welshman, instead of a harbour-view penthouse in Sydney or Vancouver (which is what I had originally aimed for). I’m very happy with the way it all played out, though. Are you traditionally published or an Indie author? What influenced that choice? I went Indie because it seemed easier than spending months writing humble begging letters to get someone to read my work or to speak to someone who knows an agent or publisher. A few years ago I went to a self-publishing seminar in London (held by Hay House Publishing) and decided to try ‘working for myself’ rather than for someone else. I’ve learned since that traditional publishers don’t offer as much as they used to; in fact, the entire industry is going through some vast dynamic changes and it seems safer to keep control and rights to myself. I’m pleased with the results I’ve achieved going it alone and see no immediate need to go traditional. To find a cure for ….. Your book goes to No 1 and fans ask for a sequel. Is there one? There already is a plan for a sequel to Conditions. Not all of the side characters in the book are given as much attention as I would have liked to and I have some great ideas where to take them next. Some parts of the story couldn’t come to a lasting conclusion within the space of the two weeks that my novel covers. That would have been unrealistic and not the kind of book I’d like to write. Tell us about the type of books you read. Do you enjoy humour ? I know a lot of other indie authors and read a lot of their work. I love humour, particularly that of Aaron David, Ian Hutson and Andrew Peters. I love a good drama, tear jerkers, historical novels and foreign literature but I read a bit of everything. What’s the strangest joke you’ve played on anyone? You probably had to be there to appreciate the moment but even my mother-in-law laughed and we spent the rest of the day in peace and harmony. Is there some significance to the flag you’re holding? It reminds me of an old Greek flag. That’s interesting. What I’m holding is the current Finnish flag. 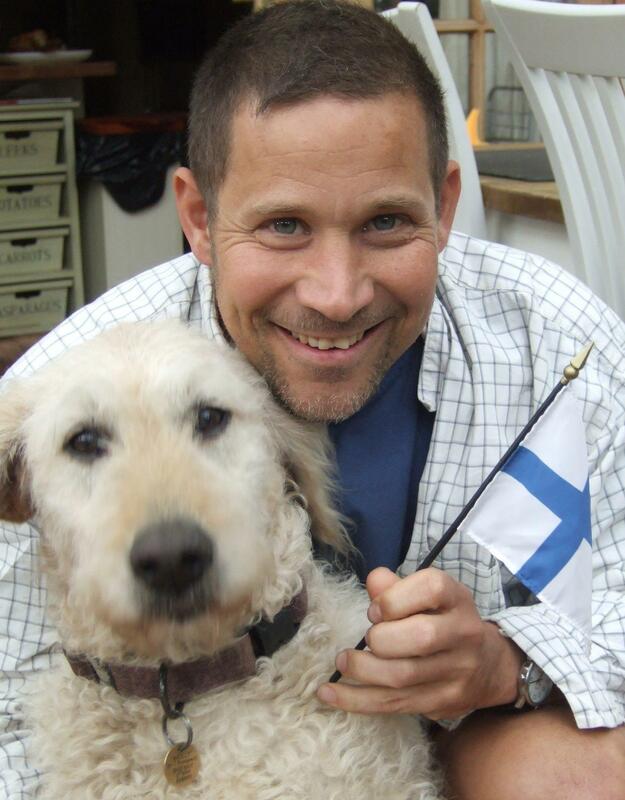 I started using that picture when I began my current work in progress,”In Search of a Revolution”, which is a historical novel set in Finland 1918 – 1950. I also chose the picture because of my dog Molly. The photo was actually taken at a Eurovision Party where I supported the Finnish entry. Any Link to the Book? Well, I’m parched. I’m sure it’s time you put the kettle on and a dark chocolate ginger or two wouldn’t come amiss. That’s why I’m interviewing you in you’re own home or I’d have to share mine. Can I interest you in a bara brith or a welsh cake? Erm. Os gwelwch yn dda. Thanks Chistoph, you’ve been very patient, very forthcoming and almost hospitable.You will have the dark chocolate gingers in for next time won’t you. My very best wishes with this and with all your books. My apologies to everyone for the changes in font size . I don’t have the facility to choose/change font sizes within WordPress so I cut and past from elsewhere in a better size. WordPress makes the changes back at random intervals and nothing I do changes them back to the original size. You asked some excellent questions, David, and the interview was excellent. I love the premise of this book, and I’ve put it on my list to read. Thank you Marylin. Christoph will be pleased. Hi, Christoph, A very interesting interview. 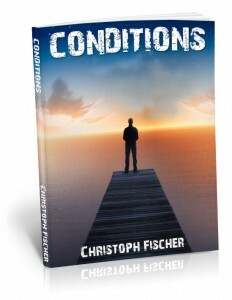 The cover on Conditions says something all on its own. I like it a lot. It’s great that you wrote the book with the purpose of raising awareness and “to make people challenge themselves.” Best of luck with Conditions and your other books, too. Great interview as usual, David. Have a fabulous week. Thanks so much Mary J.The interview is all down to Christoph’s skills with the word. I agree, the premise of the book is great, mental health issues need to be confronted. It was a pleasure to host you Christoph, you made the job easy for me. I even forgive you for not having the right biscuits at tea break. Ah beautiful Olga, that’s where I went wrong. I forgot to shout at the computer. I’ve become so laid back these days I’ve forgotten how to shout I was the calming influence after the burglary because of my chill pills. Yes, but we all know who wrote it don’t we! The printer told me. Thank you very much.It’s not fair, I gave him plenty of time to study the questions and come up with answers. I didn’t know I should have studied the questions too and made him wrong in whatever he said. I’d have looked quite bright then. I’m glad you enjoyed it Teagan. You made me smile again, thank you. Thanks for sharing. I’m going to check him out. He said your cheque is on the way to him for that so it’s OK. Thank you, it was an easy interview to do as he’s not just professional, he’s fun. Very nice interview David, you kept it flowing and interesting. Enjoyed learning about Christoph and his works. Well done! Thanks so very much. Christoph did a fantastic job with the flow, all I had to do was write some silly questions for him. Interesting interview David. How do you find the people you interview? Ha. it took me a moment to work out what context you meant then. I’ve decided you must mean how they end up on here. I promise you none are ever kidnapped or hurt in the process. In all honesty, most authors just ask me whether I’ll be willing to interview them and guest them on the blog. I rarely go out and ask because I’m kept busy with other things. If I can do it, I generally do. There are certain subjects I won’t interview on though from my own personal taboos which are mainly of the violent or strongly pornographic kind. Is that what you meant or was I wrong and you really were asking how I find their attitude/manners? Fantastic Dianne. I’m sure Christoph will be delighted. Lovely to see you here again. On the heels of the last reblog about welcoming guests into your blog, you can also interview authors about their work – Lord David Prosser meets Christoph Fischer…..
What a lovely way to discover a book. Reading about the author really makes the book come alive and alot more interesting. Hi Kim. I agree, you get a feeling for a book from the author and this is a good way to meet them, not too formal. I’m fine thanks. Hope things are well with you and have slowed down a bit.